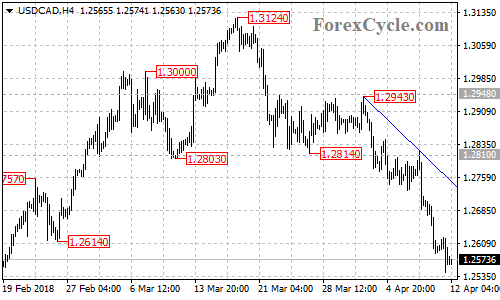 USD/CAD extended its downside movement from 1.2943 to as low as 1.2544. Further decline is still possible after a minor consolidation and next target would be at 1.2500, followed by 1.2350. Near-term resistance is at 1.2625, a break above this level could bring price back towards the falling trend line on the 4-hour chart. Only a breakout of the trend line resistance could signal completion of the downtrend.